I picked this up to read for my Children's Literature class last spring. The series is incredibly popular at my library, and all the kids I've talked to say that it's a great series, so I had to check it out. The summary tells pretty much the whole story, so I can't add too much without completely ruining the plot . . . I'm a total sucker for twin stories. 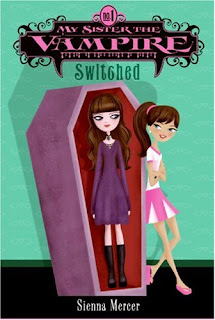 Olivia and Ivy are interesting characters, and I loved the sense of mystery in Switched. However, the plot took a little too long to develop for my tastes, and I found it unbelievable that the main and supporting characters would take so long to figure things out. If you're interested in checking out this series, it's now up to eight books!